The two plants in our garden were propagated from parent plants near Thomas’s pond. It is easy to grow these plants in South Carolina because they are native to the area and thrive in every possible condition. 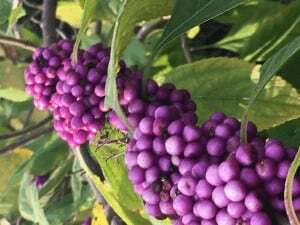 Of all the plants that he has ever recommended to someone, this is the only plant that works in every soil condition and every lighting condition – but the plant produces the most berries when given plenty of sunlight. 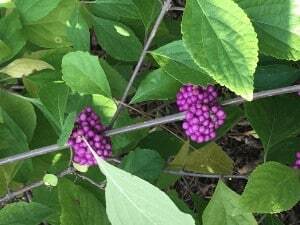 When talking with the wise women of our area, Thomas found that previous generations used this edible berry for pies, wine, and even as a natural dye for clothing. This plant has been used traditionally as an insect repellent, and recent studies have demonstrated the effectiveness of crushing the leaves to ward off mosquitoes. If you want to enjoy some of these beauties in your garden, simply grab a hand full of seeds and scatter on the ground. With the right care, you may get impressive specimens like the ones cared for by Disney’s horticulture specialists that grow as large as 6 to 10 feet tall. Thomas says his best haul of berries from one plant was a five-gallon bucket full! Propagating in this way is not only easy and fun, but has resulted in other colors (4 total) for his garden. Because they are disease resistant, it is easy for even a novice gardener to grow this plant.